Four-year-old Robert Thomsen is a big fan of recycling and waste trucks, so his mum Sarah asked if he could come and see the real thing at the team's Moresby base. Robert enjoyed seeing the depot and sitting in the trucks with his dad Simon. 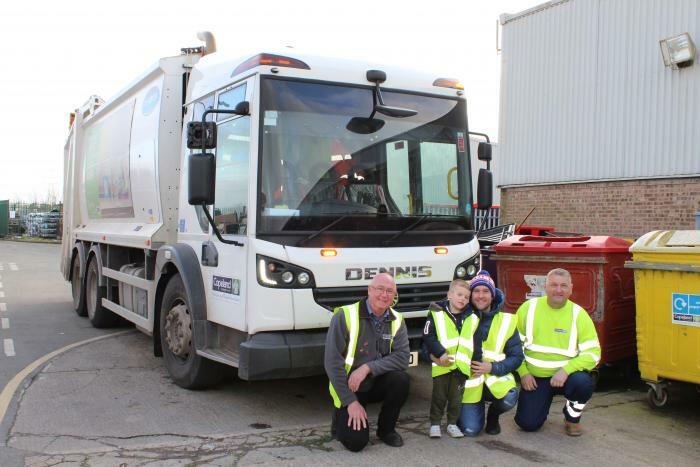 Mrs Thomsen said: "Robert has been interested in trucks from an early age - in particular bin lorries and recycling trucks. He is always excited to see the men come to collect our rubbish. Robert also likes to help us when we're putting the recycling out. He especially enjoyed sitting in the truck and beeping the horn. "Thanks so much to everyone that made this happen for him. Simon said the guys that showed him the trucks were very knowledgeable - Robert asked how long the truck was and the man knew the exact length in feet. They made him feel very special and said he could be the new apprentice." The council's community services manager, Janice Carrol, said: "Our staff really enjoyed having Robert to visit us at the depot. He was very enthusiastic and it was great to see his big smiles when he was able to get inside one of our trucks."